Shaft Length: Required Choose Options -1" -.5" Standard +.5" +1"
Buy the 2019 Cobra F9 ONE Length Irons from Just Say Golf with standard or custom specs. The new ONE Length F9 Irons from Cobra Golf are the most powerful, stable, and accurate Cobra iron yet. Available with all the custom features and technology you'll need to play your best. On sale at the lowest price, with FREE Shipping from Just Say Golf. 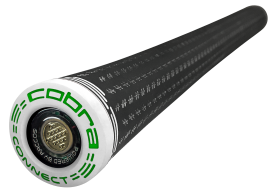 See the entire F9 product line from Cobra Golf here. The F9 ONE Length Irons are engineered to simplify your game by reducing variability in your swing to increase confidence and consistency. Engineered using matching 7-iron length and swing specifications, a ONE Length configuration simplifies your game by reducing the variability in your swing for increased confidence and consistency. Additional mass is added low and back, delivering a lower and deeper CG that increases ball speed and launch to maximize distance. The mass is strategically elevated from the contact area of the sole to maintain a sleeker appearance. A higher MOI is achieved using a combined 33g of Tungsten in the heel and toe, increasing stability and inertia for the best combination of distance and forgiveness. Using innovative shaping elements, the SPEEDBACK weight features are disguised in a streamlined shape at address. An E9 variable thickness face design is 1.8mm at its thinnest point, and expands the SWEET ZONE area on the face. A forged PWRSHELL design features a deep undercut sole with a 1.2mm internal channel that absorbs and returns more energy to the ball for higher launch and faster ball speeds. A 3-piece multi-material medallion in the 4-7 iron combines Aluminum, Thermoplastic Urethane and Acrylic foam. 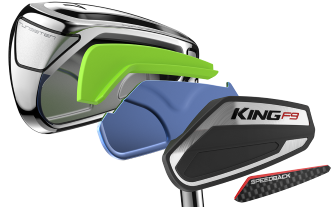 The combination of lightweight, vibration dampening materials promotes a softer, more responsive feel that is not normally found in a game improvement iron. Utilizing a precise manufacturing process typically found only in forged players irons, the F9 irons are the nly game improvement irons to feature CNC milled faces. CNC milling delivers a perfectly flat face, precise grooves, and precise lofts for maximum spin and trajectory control. CNC milled V-grooves in the 4-7 irons reduce spin for increased distance and flight time, U-grooves in the 8-PW optimize spin for improved control and accuracy, and tighter spaced wedge grooves in the GW and SW increase spin for more greenside precision. Powered by Arccos: features electronically enabled grips that work in conjuction with the Arccos Caddie app, allowing users to track their stats and improve their game. 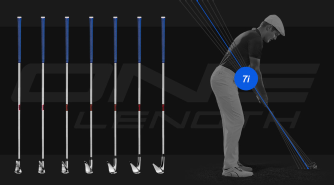 Shorter hosels in the 4-6 irons lower the CG for increased launch and distance, and taller hosels in the wedges raise the CG for lower, more controlled trajectories.